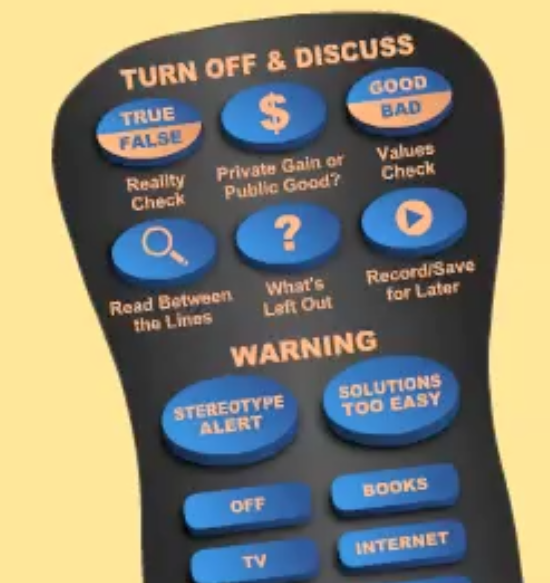 Ever since the Media Education Lab moved from Temple University to the University of Rhode Island, I was looking for a chance to update the classic media literacy “remote control,” first developed by Renee Hobbs in 1993. In early January, I was invited to present the core concepts of media literacy in front of a leading group of communication researchers, media practitioners, and journalists in Israel. The Media Regulation Forum at the Israel Democracy Institute meets twice a month to talk about the role and limitations of the Israeli media regulator, the Israeli authority for television and radio. As the manager of the Media Education Lab, I was asked to present the argument that media literacy education can be more effective than regulation. 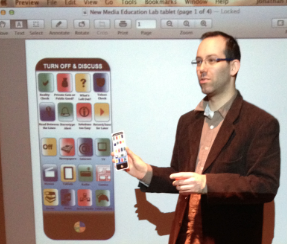 I decided to introduce the new Media Education Lab App at the forum. Using the MEL App engages people in dialogue and information-sharing, showcasing to already-media literate people how media literacy can be learned through exploration of critical questions. My idea: to consider the relationship between media literacy education and media regulation, my audience needs to directly experience the pedagogical foundations of media literacy education in practice. I chose a media text from a North Carolina television news station that featured a report about a controversial PSA against texting while driving. The two-minute news report featured a young reporter describing the graphic PSA and then interviewing three students outside their school talking about the positive effects of this PSA. Knowing that a media text with local issues could lead the conversation away from the actual activity of deconstructing a media message, I intentionally chose to use a media text which would be not so familiar to my audience. We watched the video and then started to go through each one of the features of the MEL App. We started with the Reality Check: Does this news report represent reality? On one hand, it is a report about a real PSA. On the other hand, this report was so manipulative that it was clear to participants how much of the footage of the report was staged. Then we continued to explore the topic of Values Check. Besides the obvious fact that texting is dangerous while driving, we identified two values: first, the the concept of materialism in relation to technologies like the smartphone, and the second, the decreasing value of parenting. The students who were interviewed were saying how this PSA was much more effective than their parents’ guidelines. Then we tackled the topic: Read Between the Lines. What was the actual message of this report? Is it a commercial hidden as their top local news story? Was it a message about the failure of the educational system to educate about safety? Or was it a message about white privileged teens who do not listen to their parents and get into accidents? As the discussion around the table got steamed up, we moved to the next app: Stereotype Alert. We asked ourselves why the reporter chose the three white teenagers who were filmed from high angle. Analyzing their clothing, gestures and accessories (such as the smartphones they used to watch the PSA) made it clear that there is a subtext about the culture of privileged teens. How could those three adolescents (who for some reason were not in class at that moment) be persuaded in four minutes to stop texting? The answer for that question is the next app: Solutions too Easy. The two and a half minute report explains the problem of texting while driving and offers the quick solution: parent should go to the network’s website and show their teens the four-minute-long PSA. Using the last app – Record/Save for Later – I asked the participants if this report is important to them and if there is any value to store and show it later. There were mixed reviews and feelings about this report. To conclude the activity we went to the bottom part of the MEL App to see the different media genres content that can be analyzed. It is important to understand that this activity can be done not only with TV messages but also with newspapers, movies, tablets, radio, comics, books, music, video games, and even social networks. On the other side of the MEL App we reviewed quickly the five critical questions that reframe critical analysis using the concepts of authorship, purpose, contructedness, point of view, interpretation and omission. Of course, the distinguished group of scholars, the executives, and the journalists knew full well how to analyze this report without the instructional scaffolding that the remote control provides. However, this activity showcased to them that media literacy education can be done in a fun and engaging way using a structured learning process. I was asked to come and talk about media literacy as part of the debate on whether the legislators should protect the viewers by regulating the media industry or investing in media literacy education to empower viewers’ critical thinking. It seemed that the activity and the presentation of the MEL App gave participants an experience that demonstrated the efficiency of media literacy education over media legislation, which in the digital age, cannot be entirely regulated. at the Media Education Lab”? I personallyseriously loved the post! As much as we hear from speakers, documentaries, and articles on the negative effects of media, the solution suggested for the problems has been a bit passive, if not disappointing––that we should educate each other and the young consumers to be media literate. But this remote system seems to be a first step from passive outlook on media literacy to a more interactive approach; although the device is made for a classroom setting, I feel that it can be utilized outside the class if guided with an already media literate mentor (parents, older siblings, etc.) to finally start to combat some negative effects, if not habits, emerging from the media. It is as if this series of apps is trying to make a statement that if smartphones, with their unprecedented popularity and their perceived necessity, has been used to infiltrate within the users with bigger and more frequent images, stereotypes, and harmful messages, that it can also be used “against” the media. Check it out.